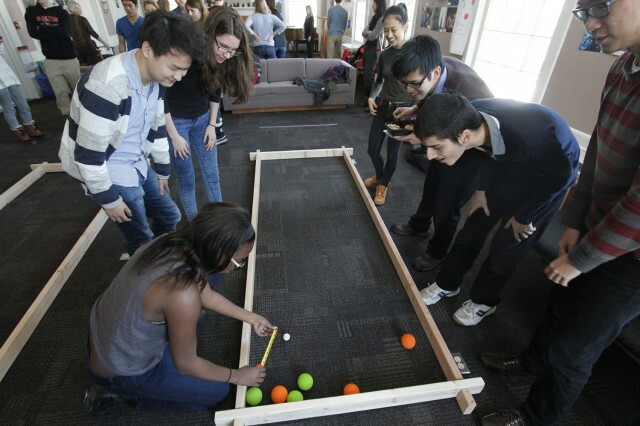 Students studying French, Spanish, Italian and Portuguese are participating in Wesleyan’s first bocce ball tournament (Bocce Pétanque Bocha Petanca) hosted by Romance Languages and Literatures. Book translated by Norm Shapiro. 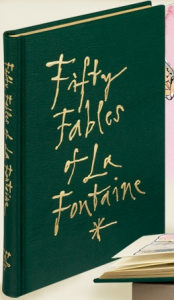 The prestigious Folio Society of London has just brought out a limited collector’s edition of Fifty Fables of La Fontaine, a book of fables translated by Norm Shapiro, professor of French. The collection, originally published by University of Illinois Press in 1985, was the first of his several volumes of La Fontaine, culminating in the award-winning The Complete Fables of Jean de La Fontaine (2007). Jean de La Fontaine was the most widely read French poet of the 17th century. This new collector’s edition presents 50 of his fables. 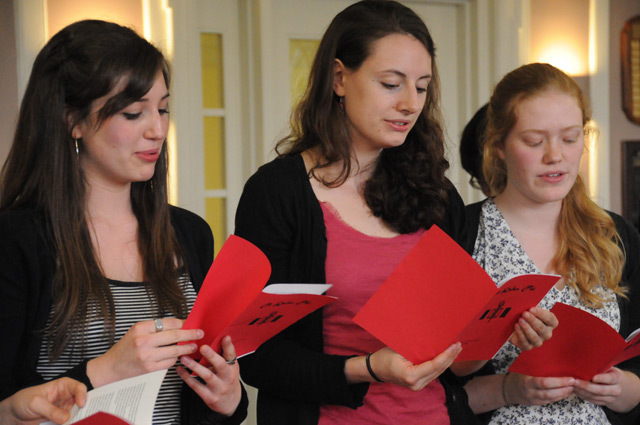 Norm Shapiro, professor of romance languages and literatures, spoke about poetry translation during Summer Festival 2013, held June 23 at the Longfellow House National Historical Site in Cambridge, Mass. 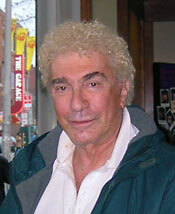 Shapiro is the author of dozens of books on French culture, literature and poetry. He recently translated most of New Orleans poet Jules Choppin’s poems for New Orleans Poems in Creole and French. The book presents a bilingual collection of forgotten treasures of 19th century francophone American literature. In 2010, he was decorated as Officier de Ordre des Arts et des Lettres by the Minister of Culture and Communication in France. The Ordre was established in 1957 to recognize eminent artists, writers and people who have contributed significantly to furthering the arts in France and throughout the world. The Romance Languages and Literatures Department welcomed 10 new students to its French Honor Society, Phi Delta Phi on May 1. 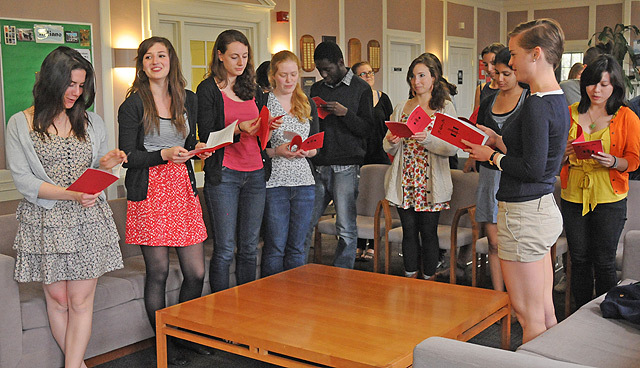 Students included Jesse Brent, Cara Colker-Eybel, Christina Ermilio, Elita Irving, Adam Isaacson, Miriam Kwieniewska, Yi Hui Lin, Fayette Phillips, Kyra Sutton and Savannah Whiting. Book translated by Norman Shapiro. Norman Shapiro, professor of romance languages and literatures, translated Comtesse Anna de Noailles’ A Life of Poems, Poems of a Life. The poetry collection was published by Black Widow Press in 2012. 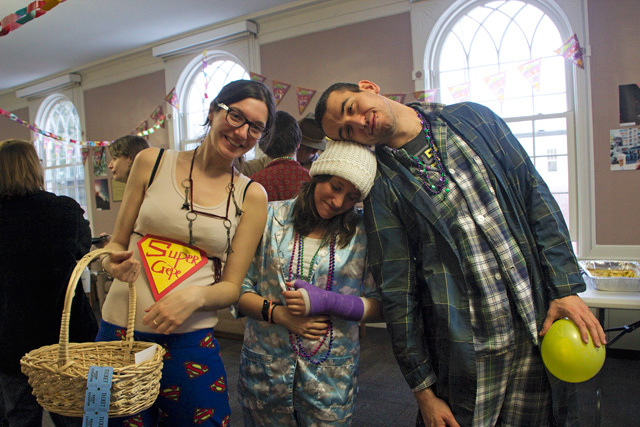 Graduate students Andrea Ballanti, Delfina San RomanGrossi, and Tifenn Philippot dressed up in pajamas during the Pan-Romance Carnival Celebration, hosted by the Romance Language and Literatures Department on Feb. 24. Eric Graf, visiting assistant professor of Spanish in the Department of Romance Languages and Literatures, speaks about the monetary policy and the economy on Coy Barefoot. Graf connects the dots between the fall of the Spanish Empire and the House of Hapsburg with the fiscal challenges now facing the United States, Chairman of the Federal Reserve Ben Bernanke and the very real threat of inflation in the 21st century. “We’ve been here before. There are lessons to be taught in history. What has happened will happen again. 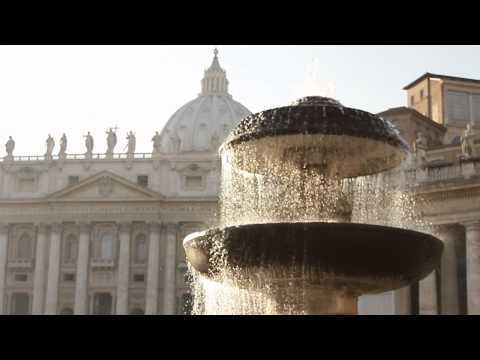 What America is experiencing now is similar to 16th century Spain,” he says in the podcast. Graf specializes in medieval and early modern Spain, modern Latin American fiction, 19th Century Romanticism, avant-guard poetry and the Popol Vuh. 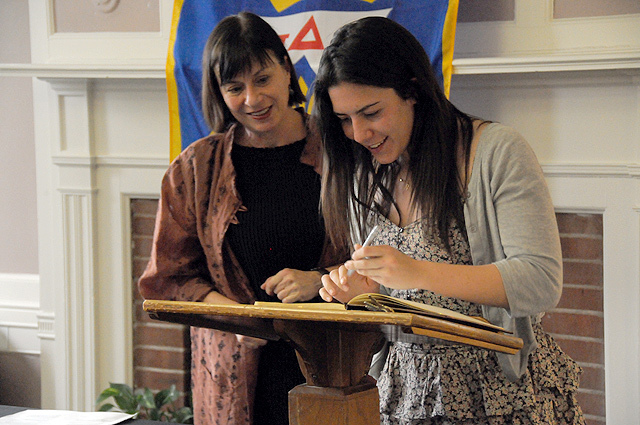 Assistant Professor Maria Ospina, who recently completed her first year in the Romance Languages and Literatures Department at Wesleyan, can trace her academic interests directly back to her childhood in Colombia and her longtime interest in history. 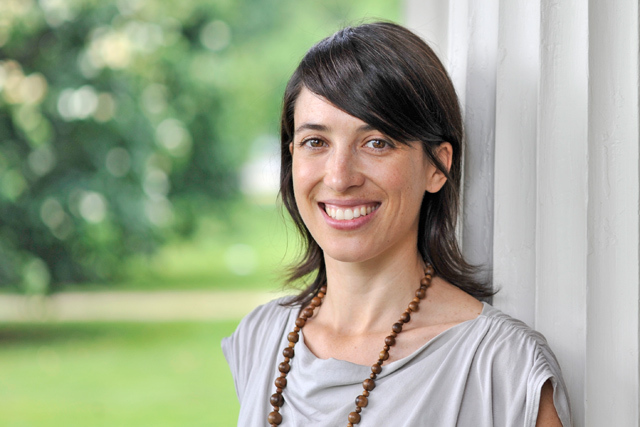 Ospina left Colombia when she was 18 to attend Brown University, where she studied history and cultural studies. After working in New York for a few years, she went on to earn a Ph.D. in Hispanic Literatures from Harvard University. During her time at Harvard, she traveled frequently between the U.S. and Colombia in order to coordinate and curate the Cartas de la Persistencia (Letter of Persistence) project. Ospina describes the project as “an important public trans-disciplinary project and archive funded by one of the country’s major cultural institutions. This amazing archive of thousands of recent testimonies about civil resistance to violence led us, among several public initiatives, to publish an anthology, which I edited in 2008.” After earning her Ph.D., Ospina went on to hold a two-year post-doctoral fellowship at Harvard, where she taught several courses on contemporary Latin American culture. 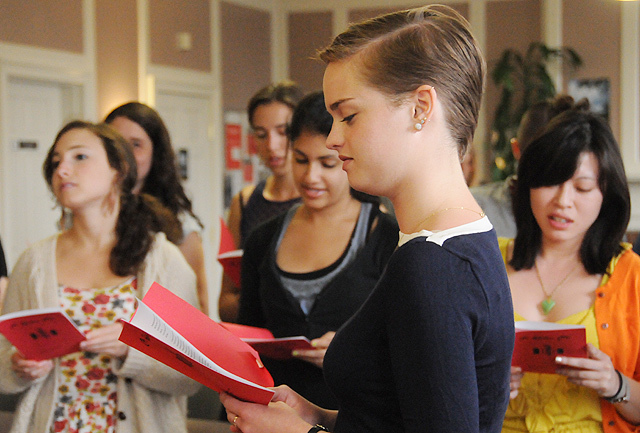 During her first year at Wesleyan, Ospina taught “Introduction to Hispanic Cultures,” the gateway class to the Romance Languages and Literatures major. In the spring, Ospina taught a course called “Minor Tales: Narratives of Youth and Childhood in Latin America,” which focused on Latin American literature and film about childhood and youth in the 20th and 21st centuries. Next year, she looks forward to teaching the “Introduction to Hispanic Cultures” course again during both semesters, as well as a course called “Dangerous Plots: Fictions of the Latin American Jungle.” This class will explore the ways in which nature has been plotted in fiction, films and popular culture, focusing specifically on the tropical jungle as a space that has been central to the way Latin America has been imagined for centuries. 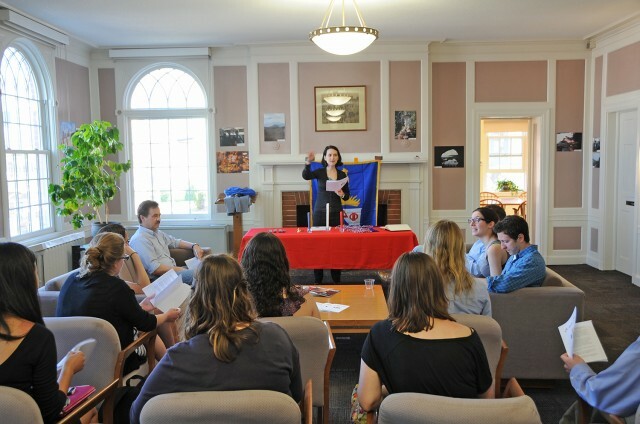 In the spring, she will teach “Spanish American Literature and Civilization,” which studies some of the major writers and intellectuals in Latin America from the colonial period to the present. Ospina also had a very productive year in research. She recently finished an article about representations of Amazonia in the context of the War on Drugs, which will be published in Chile in the fall as part of a volume on virtual geographies of Latin America. She also presented work on memory and armed conflict in recent Colombian film at a conference in Lisbon focusing on post-conflict cinema, and attended the Cartagena International Film Festival. 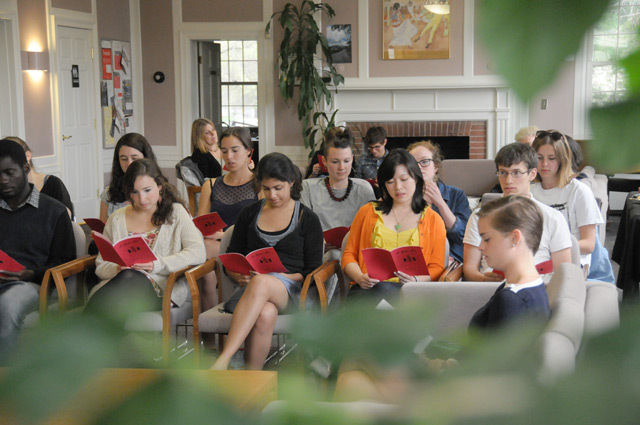 Here at Wesleyan, Ospina is involved in organizing a mini film festival of recent acclaimed Spanish and Latin American film, which will take place at the Wesleyan Film Center in September. “Everyone is invited!” she says. Outside of work, Ospina enjoys writing fiction, biking, dancing, and spending time in New York City. In addition, she says, “Recently, I’ve also taken up vegetable gardening, because I want to grow some of the food I eat. I grew up in a family of farmers and gardeners in Colombia, but I’ve never had the chance to plant a garden in the Northern Hemisphere—that is, in a place with seasons. It’s been fun, but I’m in a strenuous fight with the local ant population.” Of late, Ospina also has taken an interest in studying birds, particularly migratory species. Jeff Rider, professor of romance languages and literatures, professor of medieval studies, has received a residential fellowship from the Royal Flemish Academy of Belgium for Science and the Arts in Brussels for the second semester of the 2011-12 academic year. Rider is in Brussels working with two other fellows on the topic, “Perception and Performance of Social Identity in the Nascent Urban Societies of the High Middle Ages.” In addition to presenting a lecture to other fellows at the center, he’s presenting lectures at the University of Ghent, the Catholic University of Louvain, the Royal Library of Belgium, the Charles University in Prague, and to a European research group (Interfaces: The Integration of Latin and Vernacular in a New History of European Medieval Literature) in Rome. Rider also is at work this semester on an edition of the most important medieval Flemish chronicle, Ancient Chronicle of Flanders, which will be published by the Royal Historical Commission of Belgium.